Seventy million years ago, a mollusc lived at the bottom of the warm, shallow Bearpaw Sea, in the area that is now southwestern Alberta, near Lethbridge. That mollusc, the ammonite, is prized as a fossil, but today its shell is grabbing the spotlight. There is a lot of material below that, but if you are going for Colour Heaven, why buy so-so? 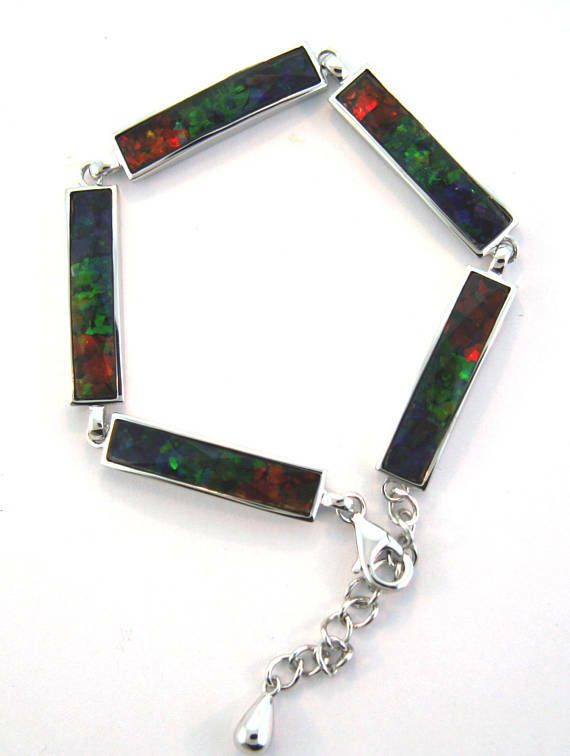 Hold out for ammolite with three or four intense colours that shift with flashes like fine opals will—and then some. 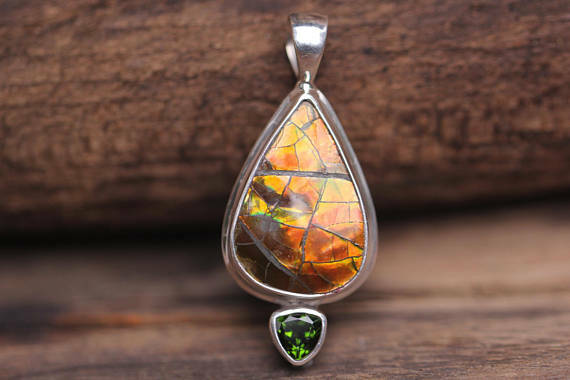 The DavidMorGems site features contemporary, clean designs and a range of ammolite colours, so if you like this ultra-colourful gem, take a look. What makes ammolite so ethereally alive? The same mineral found in the nacre of the pearl-forming mollusc, other molluscs, and corals: argonite. 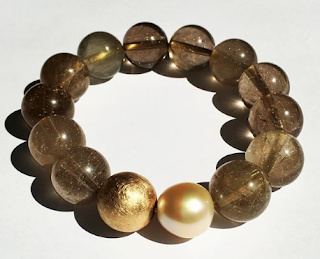 Argonite has a crystal structure, which is why genuine pearls seem to glow from within. (Pearls also contain another organic compound, conchiolin.) Mother of pearl and ammolites are cousins, but what a difference in looks! 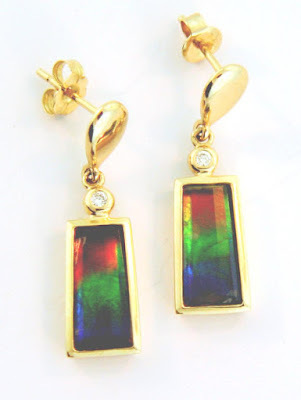 You have to baby it; at only 4.5-5 on the Mohs scale, ammolite is too soft to wear unprotected in most settings. 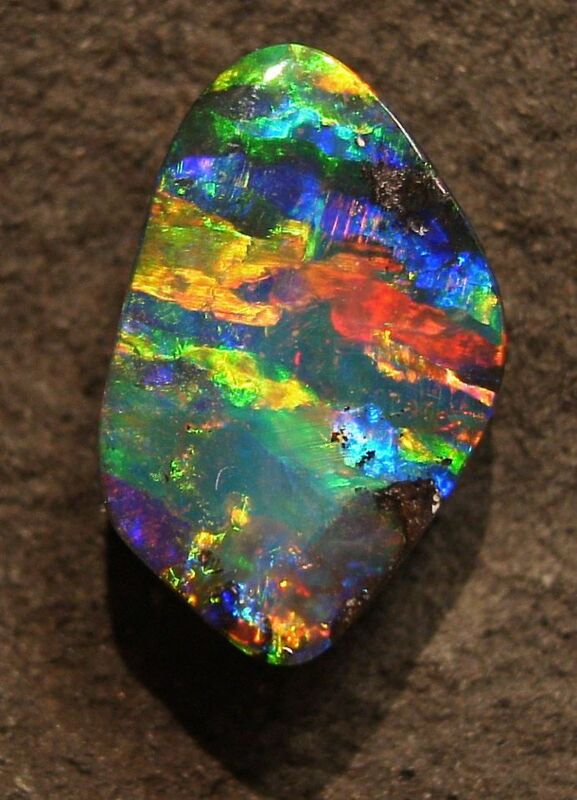 It is usually sold as a triplet, with a sturdy applied back (ammolite can flake, like shale, the stone from which it is mined) and a clear protective overlay, much like the film you put over your cell phone. If you buy ammolite, remember your gem lived at the bottom of the sea for literally ages; sunlight can fade its colour. I am interested in what other stones (besides diamond, the ultimate neutral) play nicely with ammolite, and liked this combination of matrixed ammolite set in sterling with a chrome diopside (which you may recall is the lushly green stone Miriam chose when she reno'd her heirloom ring). This pendant is from British Columbia's Graceanchor; price, $CDN 185. I will not be elbowing you out of the way; ammolite reminds me of black light posters in head shops. (Tells you what I was doing in university.) But that is exactly like colours I can't wear: I have seen spectacular pieces on other women, their personal Northern Lights. And if this is for you, shop for your ammolite piece soon; it is quite rare, and because demand has built, there is concern about depletion of the mines. This Wikipedia article describes what makes prized ammolite; in short, the more colours it shows, and the brighter, the better. Wow, this post is right up my alley. I love bright colours and ammolite looks like a lot of fun. That bracelet is lovely and I like the combinations of materials in the pendant. Never heard of ammolite, thanks for the introduction. 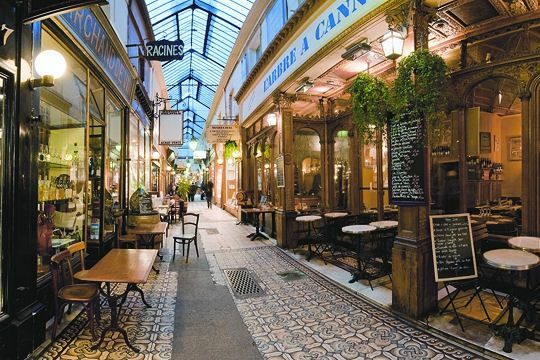 Duchesse, have you seen any pieces here in Montréal? I love the colours and would like those set in silver earrings, but the fragility for the cost would give me pause. 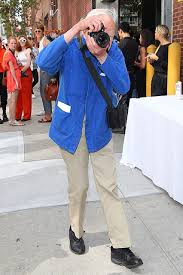 I'd love to wear sombre tones (not necessarily black) and have the flash of those. That wouldn't look too head-shop black light poster. LauraH: it is colourful even in the "good" grades. Generally persons who like the flash of colour on darker opals will like ammonite. lagatta: Local jeweller Christine Dwane (www.christinedwane.com). A very fine jeweller with a clean, graceful aesthetic- buther ammonite pieces might not be on her site; I saw some ahwile ago at Guyomarc'h. Check jewellery section at MMFA boutique, stop by Marché Bonsecours, too. I would not buy it in a ring setting but it should be fine as earrings, especially if stored (like I do) in a sectioned box. I use old candy boxes. Ammolite producers know their product so have introduced those doublets or triplets to protect the mineral. lagatta: Sorry for typos, I am working and in a hurry- but think you can decipher it. No problem whatsoever, my mind "cures" those. Yes, I love Marché Bonsecours. Natural fragrances: Draw for free sample pack! Jane Birkin: "My beauty...it's gone"